If these little birds aren’t visiting your yard or if you want to see more of them, here are 3 easy tips to attract hummingbirds to your yard. 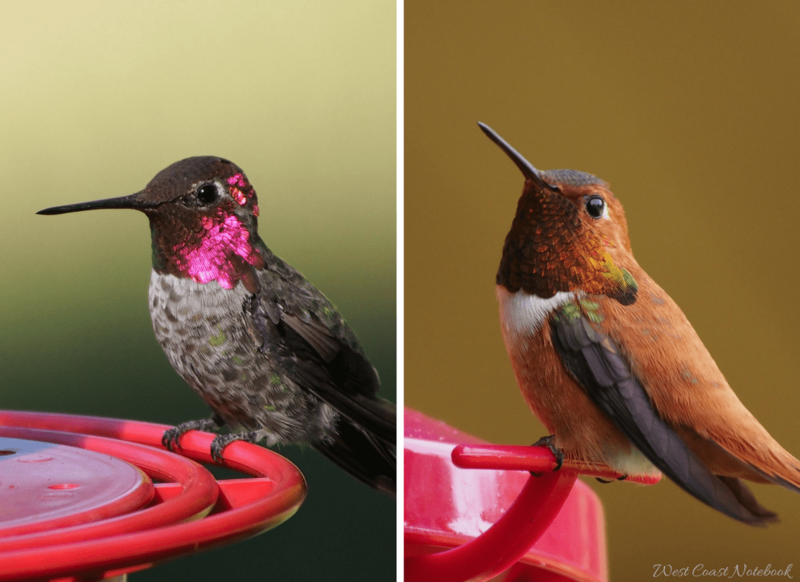 Over the years I have tried many different methods to attract hummingbirds to my garden and yard and have narrowed them down to these three. This one is the most obvious. Hang a hummingbird feeder. 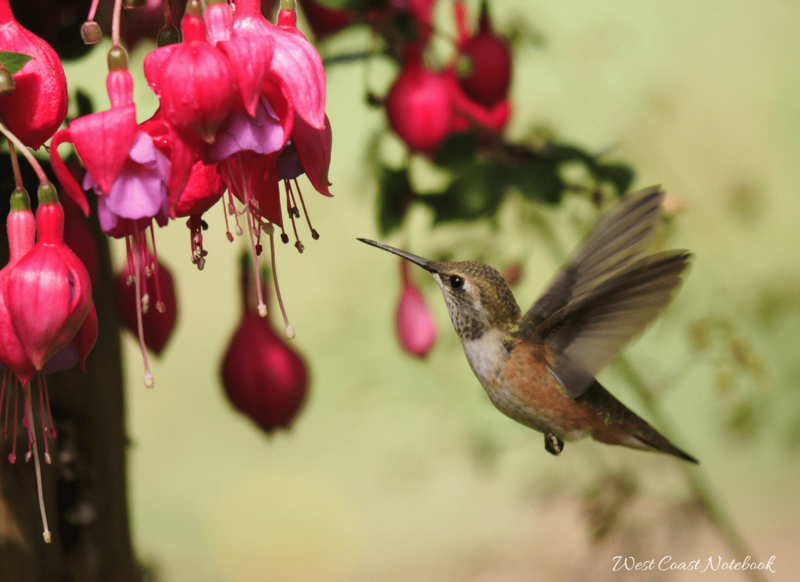 Now… this won’t work for everyone all the time, but we are lucky here on the west coast and have Anna’s hummingbirds all year-round. If you are putting out a feeder for the first time, check to see if others are putting any out in your area. 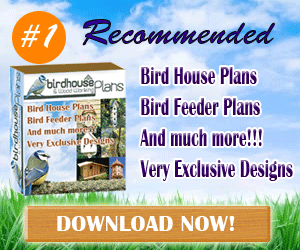 Also, check with your local bird store or online to see where their migratory routes are. It can take up to a couple of weeks for a hummingbird to show up at your feeder so don’t get disappointed if they aren’t there the same day. Give them time to find it. Sometimes people don’t want to use a hummingbird feeder as they travel or might be away from home for indefinite periods of time. But go ahead if you want to see them. Each time you come back, it will just be like setting out a new feeder, the birds will find it again and return to your feeder. In my area, I don’t worry too much as there are numerous people feeding the hummers in my area. Remember if you’re feeling guilty, that the tiny little hummingbird survived just fine long before you ever decided to supplement their diet. 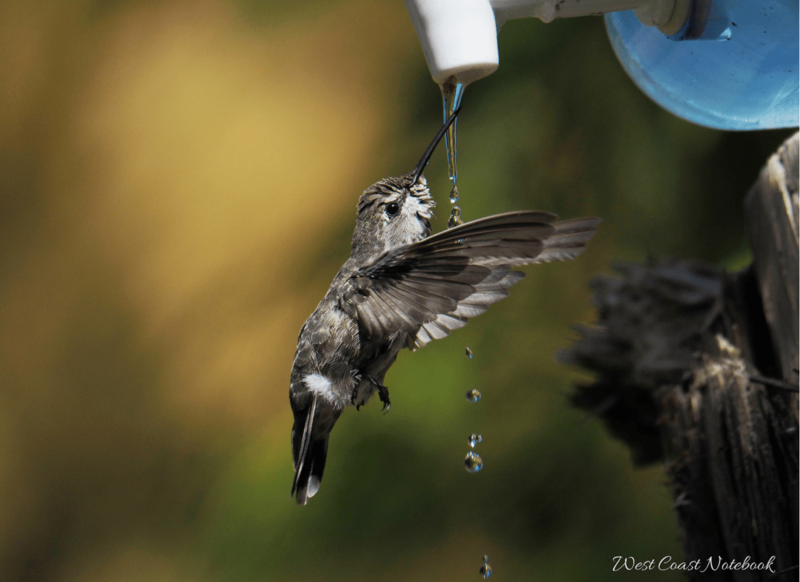 Hummingbird nectar is the easiest bird food there is. Just sugar and water. Please don’t use honey as it can promote a fungal situation that can harm the bird or food colouring as it’s not healthy for them either. I put the sugar in a measuring cup and add about 1/3 of a cup of boiling water and stir until all the sugar is dissolved. Once the liquid is clear of crystals I add in the rest of the water using it cold. This then allows me to use the nectar right way as it’s cool enough to put into the feeder. A lot of people make a large batch and put it into the fridge especially if they have lots of hummingbirds and the feeders empty a couple of times a day. I find that I go through the most nectar when the young have fledged and are actively hunting for food on their own. The other time is just before nightfall and there will be a swarm of hummingbirds coming to the feeders to stock up on nighttime reserves. how easily can it be filled? how easily can it be cleaned? can other birds feed on it? and do the hummingbirds like it? I’ve had some hummingbirds that just won’t go to a feeder at all but apparently, it’s what they are used to. If they have grown up with one feeder, it takes a while for them to go to another type. I would love to show you all the feeders that I’ve had in the past, but instead, here is the one that I’m using now as it fills all my requirements. The key to its success is that it’s not gravity fed like most of the other feeders which can cause problems with wasps and leakage. Here is a short video on the brand that I am using and I’ll put a link to Amazon as well. The middle section is an ant moat for any crawling insect and also keeps out the earwigs as they love the nectar. Really easy to clean, you just lift off the red top. I have the 16 oz one that has 6 ports and another thing I love is that you can actually see the hummingbird drinking through the clear plastic. Here is the Amazon link for the 12 ounce one shown above. It has a 4.5 star review from over 1487 customers. I would say that’s a pretty good average. Note: I often hear about people putting oil or grease on the rod that is holding the feeder in order to stop ants from getting to the nectar. Please DON’T do it. If the hummingbirds or any bird for that matter get grease on their wings it can impede their flight and insulating ability. Think shorebirds and ducks from oil spills and the damage it can do to them. The second way to attract hummingbirds to your yard doesn’t require you to be there or to feed them on a daily basis. This might be a good option if you are worried about being away from home. Flowers. Yes… that’s it. Flowers! But not just any flowers. 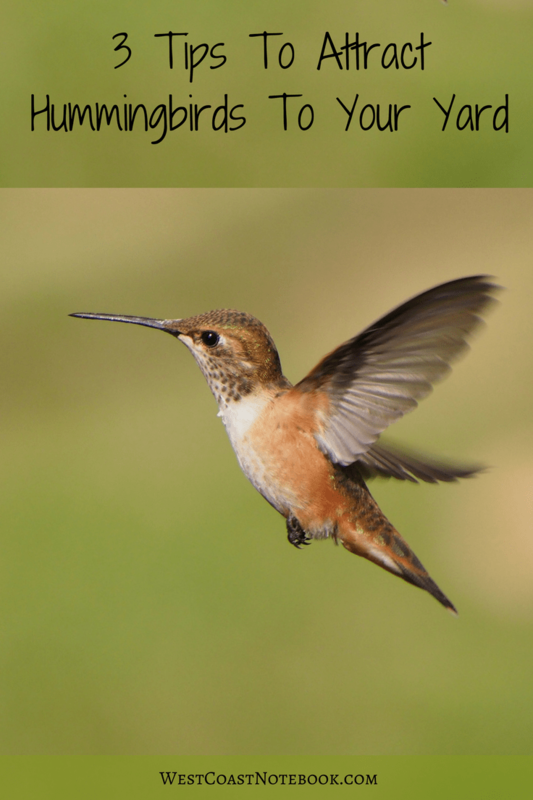 Ones that hummingbirds like which are usually tubular in shape as they hold a lot of nectar. Every area is different for what can be grown, but if you do a search for – hummingbirds flowers state (put in the name of your state or city) Google will give you feedback of what will grow in your area. If you are living where there is no backyard to plant flowers, then hanging baskets of fuschias are my go to flower. I alway have a plant or two hanging for the hummingbirds to enjoy and it’s a delight watching them go from flower to flower. It is said that nasturtiums and petunias are good attractants for hummingbirds as well but I have never seen one go to either of these plants yet and I normally plant them for colour every year. This is the first year I’ve grown scarlet runner beans and they have been a big hit with the hummers. 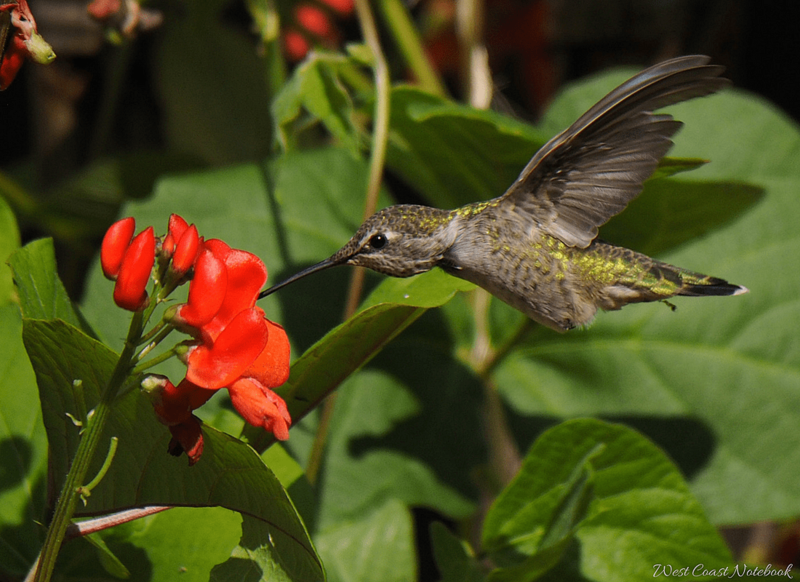 Not only do the hummingbirds help pollinate, they look spectacular flitting from flower to flower. I will definitely plant these again next year. Water, running water to be exact. I have 4 birdbaths in the yard and as soon as I turn on the tap to add fresh water the little hummers are there. They fly around and inspect the flow and hover around. Usually, the flow from the tap is a little too powerful for their tiny bodies, but I have a way around that. It’s called a drip and you can find more about how I built a DIY version for my yard here. Normally the bird baths are filled with fresh water once a day, especially when it is hot and dry weather and when I do that, I also fill up the drip container. Setting the drip to a slow stream I settle down to watch the birds flock to the birdbath. 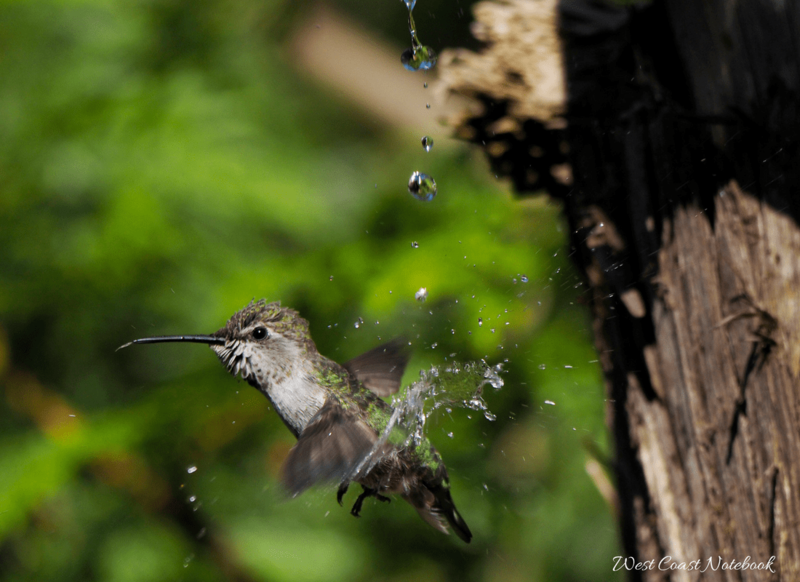 The hummingbirds are one of the first to line up to have a bath. or sit on the side and put their heads right under the water and toss it over their backs. But… the only time I see them doing these 3 things is when the drip is on. Otherwise, they leave the birdbath alone. This gives me a perfect opportunity to get some great pictures of them as their jewel-like colours flash as they fly by. It’s almost time for the rufous hummingbirds to make their way south for the winter again, but the Anna’s will stay and light up the yard all year-round. I am delighted that these little beings grace my yard every year as I hope they do yours.